Too many NHS trusts in England are failing to implement the recommendations of 2009’s Boorman review, which means they are failing to reduce staff sickness absence and are less able to release funds that could be used to improve patient care, the Chartered Society of Physiotherapy (CSP) has found. The society’s research estimated that NHS trusts in England have spent more than £1 billion on sick pay in the past three years. The society used the Freedom of Information (FoI) Act to obtain documents that, it said, reveal that musculoskeletal conditions accounted for more than 19.3 million sick days among NHS staff during that period. The study Fit enough for patients? 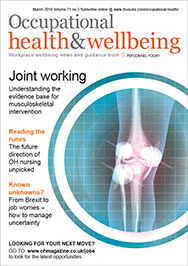 An audit of workplace health and wellbeing services for NHS staff found that more than one-third of the 163 trusts that responded to the FoI request admitted that they did not have a strategy in place for reducing staff sickness absence. Nearly one respondent in five did not even offer staff rapid access to physiotherapy to help them stay in work, and so reduce any waiting times for patients that were caused by staff shortages. Sick-pay bills at trusts without strategies have risen by 14% in the past three years, as opposed to just 4% for those with a plan, the report added. CSP chief executive Phil Gray said the delay in implementing the suggestions from the Boorman review was an “unacceptable waste of money on prolonged sick leave” and damaging to patient care. “The NHS takes a double hit when an employee is unfit to work – there is the cost of covering that absence and a gap in provision that can lead to cancellations and longer waiting times for patients,” he said. “In the current climate, we frequently hear that services are being cut because of budget constraints. Yet trusts seem to be deliberately failing to implement the Boorman recommendations and this obvious way to save money. Of the 90 trusts able to provide sick pay data for the past three years, the report found that sick-pay budgets had risen in 58%, and fallen in just 42%. Nearly one-third of trusts were unable to provide sick pay data for the last financial year covered in the study (2011/2012), with some admitting they do not collect it. Although overall sickness absence across the NHS has fallen since the Boorman review, progress has stalled and rates fell by just 0.4% between 2010/11 and 2011/12.